Could the marriage of residential solar photovoltaic and thermoelectric wood stoves soon be a reality? 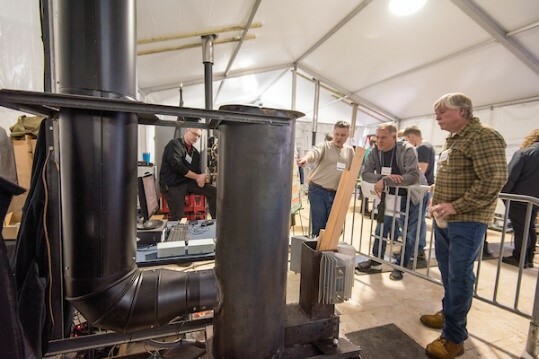 The results of our 2018 Wood Stove Design Challenge suggests that it just might be, and a productive marriage at that! The Challenge was held on the National Mall in Washington, D.C., in a large tent, from November 8-12. The U.S. Department of Energy (DOE) Bioenergy Energy Technology Office (BETO) helped fund the Challenge. In its press release announcing the Challenge, BETO referenced the Alliance for Green Heat’s stretch goal that integrating thermoelectric wood stoves with solar PV systems could increase a home’s wintertime power by 50 percent in northern climates, and provide a renewable energy alternative to oil and natural gas heating systems. This year’s winning thermoelectric stoves generated enough power to demonstrate that we are well on our way to meeting this goal. 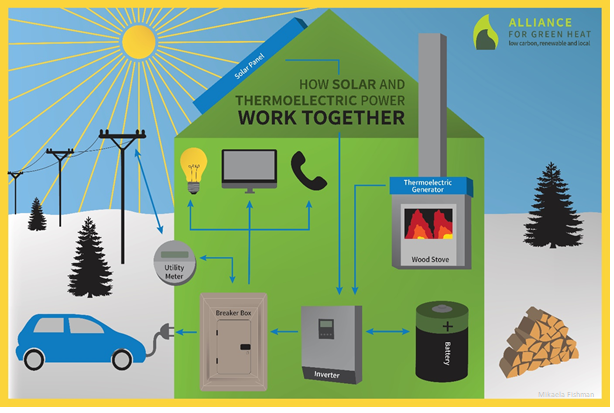 Short winter days, clouds, and snow are the Achilles heel for solar power in northern climates. However, solar power is critical to reducing CO2 pollution and climate change. In Vermont, a home may get only 2-3 hours of effective sunlight in December versus 6-7 hours in July. Here’s where thermoelectric wood stoves come in: Residents typically operate their wood stoves during the morning and evenings, when solar PV power is at its lowest. The Alliance’s Organizing Committee invited five teams from industry and academia to participate in the thermoelectric stove competition of the 2018 Challenge. An independent panel of judges evaluated each stove and selected the first and second prize winners. 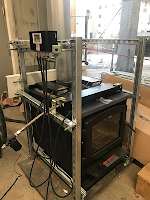 During the 3-hour test period, the judges scored the stoves based on power output, particulate matter and carbon monoxide emissions, safety, degree of automation, and efficiency. (We’ll review the stoves’ emissions results in a later blog post.) After 30 minutes to warm up, electric power output was measured every ten minutes over the remaining 2½ hours. Table 1 provides a summary of the results. First prize went to E-Stove by Wittus and HE Energy. The stove generated a maximum of 268 watts, an average of 161 watts, and a total of 276 watt-hours over 2.5 hours. The E-stove, manufactured in Germany, is designed to be installed in a living room. It works like a hydronic boiler and generates enough hot water to heat a medium size or large home. For the test, the hot water was pumped through two radiator systems, which discharged the heat into the tent. The power control system can be connected directly to a battery, like a TESLA Powerwall, or supply a 220-volt output (110 volt for U.S. market). 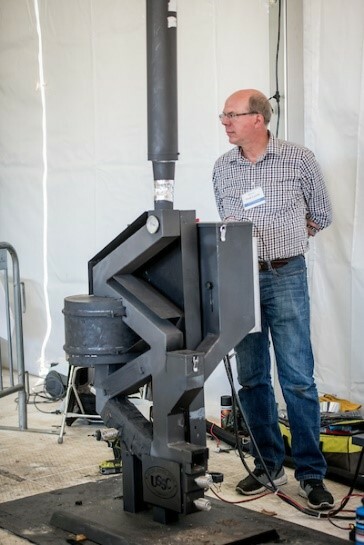 HE Energy expects the stove to be commercially available in fall 2019. Second prize winner, Wiseway by Vulcan Energy and Hi-Z Technology, generated a maximum of 139 watts, an average of 123 watts, and a total of 235 watt-hours over 2.5 hours. The average power output of the Wiseway wasn’t substantially less than the E-Stove, even though the maximum wattage was almost 50 percent less. The Wiseway combustion temperature was kept even by a gravity fed pellet system that continuously fed pellets into the combustion chamber. In contrast, power output from the E-Stove dropped from a high of 268 watts to a low of 38 watts as the logs burned down. The Wiseway uses a water-cooled thermoelectric generator (TEG) to produce electricity. The hot water from the TEG was pumped into a hot water tank and through a radiator to discharge heat. The TEG has a power control center that includes a USB port, and a 12-volt and 110-volt output. Vulcan Energy designed the Wiseway to demonstrate the company’s capabilities to custom design thermoelectric generators for pellet stoves. It has no immediate plans to commercialize this stove. The Kd3 by Unforgettable Fire generated a maximum of 85 watts, an average of 49 watts, and a total of 118 watt-hours over 2.5 hours. The Kd3 is a downdraft stove designed to generate electricity, and heat water like a hydronic boiler for radiators and domestic hot water. It uses two thermoelectric generators by FireVolt to generate electricity for lighting a home or charging a battery. It includes a power control center to manage power output from additional power sources like solar or wind generation. Due to limitations of our DC load meter, the judges and Kd3 team faced several challenges to accurately measure the power output of the FireVolt thermoelectric generators. We conducted a third unofficial power test, which demonstrated the Kd3 could generate 127 watts of power. Unforgettable Fire expects to have the Kd5 commercially available in 2019. 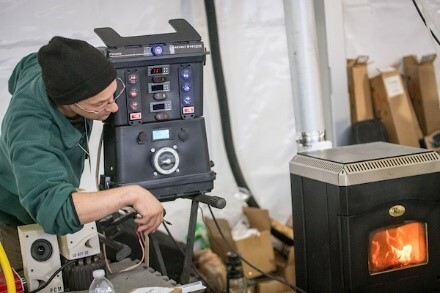 A team of engineering students from George Washington University retrofitted a thermoelectric generator to work with a stove donated by England’s Stove Works. It generated a maximum of 32 watts, an average of 22 watts, and a total of 47 watt-hours over 2.5 hours. The team used a TegMart thermoelectric generator, which has a power control center with a dedicated power output for a water pump, USB port, and 12-volt output for charging a battery. The event provided an excellent opportunity to introduce GW engineering students to wood stoves and thermoelectric principles. The Downdraft Rocket by ASAT uses a low-cost thermoelectric module to generate a maximum of 14 watts, an average of 12 watts, and a total of 28 watt-hours over 2.5 hours. ASAT was not attempting to design a thermoelectric stove that maximized electric power output. Instead, their stove was designed for use in the developing world to cook food and generate enough electricity to power LED lights and/or charge a cell phone. The combustion chamber, catalytic converter, and chimney have low emissions to protect the health of users. Its passive air-cooled system requires less maintenance then a water-cooled system. When compared with daily wintertime solar power output, the E-Stove demonstrated that a thermoelectric stove could potentially generate an energy output equal to 50 percent of a 5kW residential solar PV system. 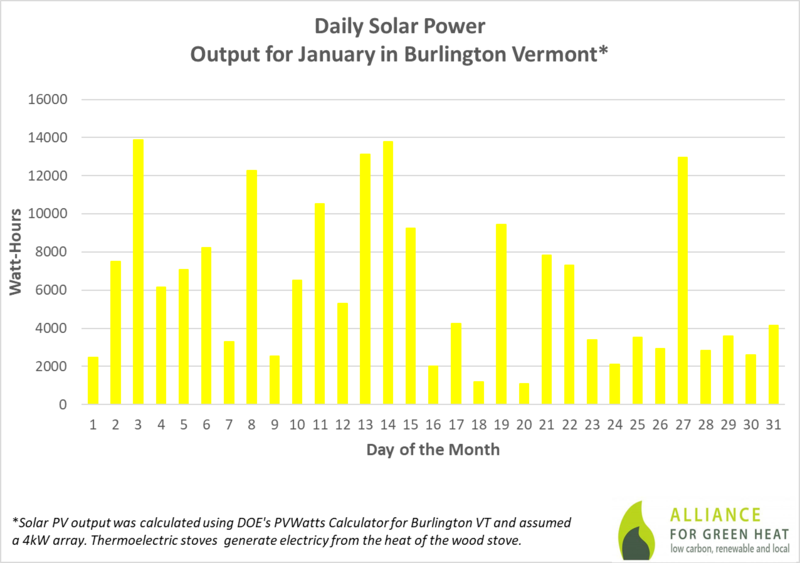 The graph below shows the large variation in daily power output of a 5kW solar PV system during January in Burlington, Vermont. 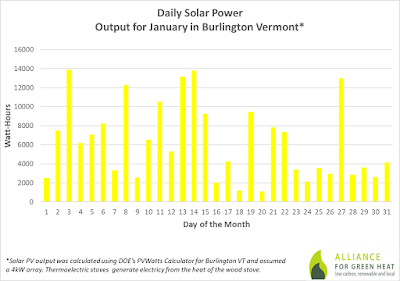 For 15 days in January, the solar PV system generates less than 4,000 watt-hours of energy per day, due to limited daylight, clouds, and snow. If the E-Stove was operated for 20 hours per day, it could generate 2,208 watt-hours of energy, which equals 52 percent of the solar energy produced during these 15 days. However, for the entire month, the E-Stove would increase total energy output by only 38 percent. Okofen pellet boiler with a Stirling engine. Pellet boilers with Sterling engines could also supplement solar power. Maine Energy Systems demonstrated two such units at the Challenge, though the units weren’t eligible for a prize. The larger system for commercial buildings can produce 50-60kW of heat and 4-5 kW of electrical power. The smaller system, which will not be available in the United States until 2019, produces 9-16 kW of heat and 0.6-1.0 kW of electrical power. This type of system could solve the Achilles heel problem faced by solar power during the wintertime. The commercial system, which operated every day at the Challenge, was surprisingly quiet. The Sterling Engines will be expensive until larger scale production can reduce their price. While thermoelectric stoves and Sterling Engines look promising, none of the thermoelectric stoves have been commercialized, they will be very expensive until they’re mass produced, and their installation and maintenance require an expertise in wood heat, plumbing, and electricity. These are daunting challenges, but then so is climate change. 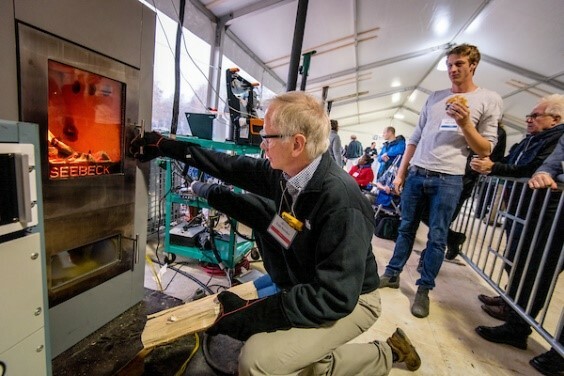 The 2018 Wood Stove Design Challenge is over, but the future of thermoelectric wood stoves is just beginning. The power output of the E-Stove’s thermoelectric modules exceeded the 150-watt capacity of the Alliance’s DC load meter, so we used Team Wittus’ DC load meter. Based on DOE’s PVWatts Calculator. 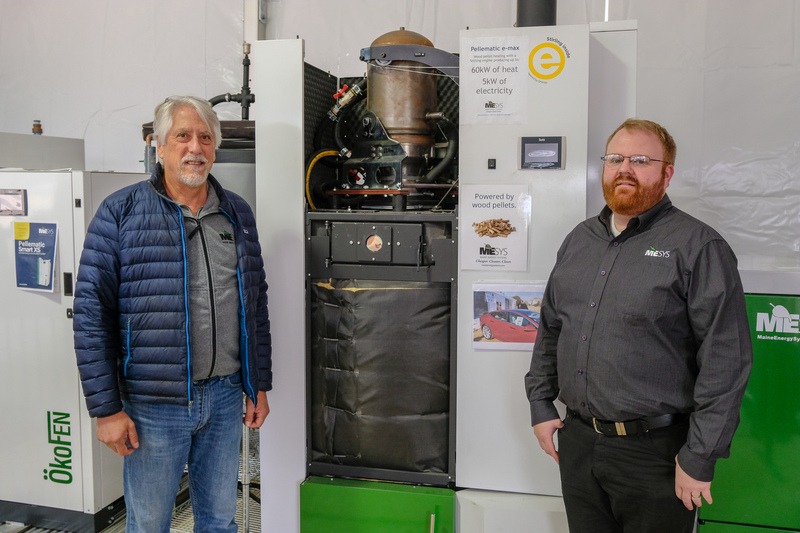 The Alliance for Green Heat and the Vermont Biomass Energy Resource Center has developed a proposal to provide a much more robust analysis of the potential role of thermoelectric stoves.